In today’s world, the use of mobile devices is on the rise. As a business owner, you want to be accessible to a world of tech users, regardless of their device. Ideally, once anyone arrives at your website, you want it to be a pleasant experience. This will happen if you utilize an attractive color pallet, have engaging images, utilize space effectively, and provide quality content. It is imperative that all of this is easily navigated from start to finish during their visit. It is also important that your site adapts for the user. Their journey may have begun at home on their desktop. Later on, that journey may be continued from their phone, whether it’s vertical or turned horizontally. If you are utilizing responsive web design, the entire journey will be a good one. Perhaps one that they’ll want to return to often, even commit to. 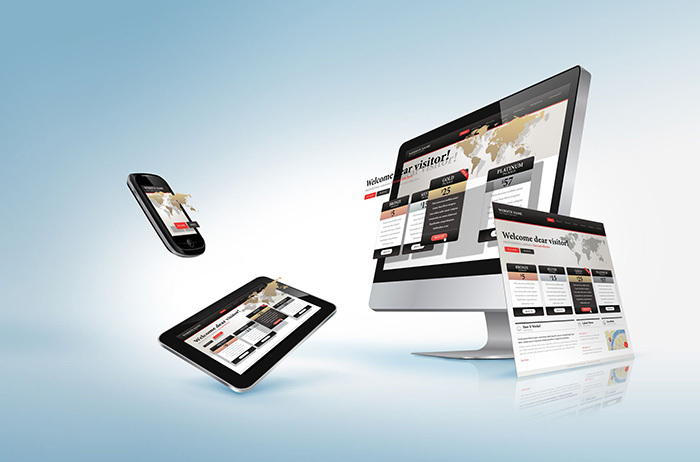 There are numerous advantages integrating responsive web design. First of all, attract attention, then hold onto it! Color usage and images can be effective for that, but so can font and how it’s used. Spacing can make a big difference, focusing on bits of information. Spanning out text can help a reader to scan a bit. Text coupled with images captures attention and is quickly absorbed by the mind. Enlarging text, and using bold print can emphasize details you want your reader to grasp. Don’t forget about titles and headings to help the brain locate sought after information. Fluid grids go a step further in order to adapt to various devices. Instead of designing layouts based on rigid pixels or arbitrary percentage values, a fluid grid is more carefully designed in terms of proportions. Then when a layout is squeezed onto a tiny mobile device, or stretched across a large screen, all of the elements in the layout will resize their widths in relation to one another. The journey and ease of use! That’s what it’s all about! Web Fox Marketing is a website agency in Livonia, Michigan SEO as well as digital marketing experts. We serve our surrounding community near Livonia, Novi, West Bloomfield, Farmington Hills, Royal Oak and beyond. In addition to digital marketing services, we are knowledgeable in search engine marketing advantages, Google ads marketing (PPC), SEO services, social media marketing, and much more! A web site is the beginning, as success throughout our digital world depends on local ranking prominence and max exposure to several advertising channels. Our Michigan lead generation company is glad to help you with any questions you may have, thanks for visiting! Contact us now and let’s get started building your web presence! On a final note, as you would expect, Google has great resources talking about SEO, and how to build your online advertising campaign. Here is a great video created by Google, check it out here: How Search Works website.